The beach of Vrititsa on the island of Alonissos in Greece, information and pictures. 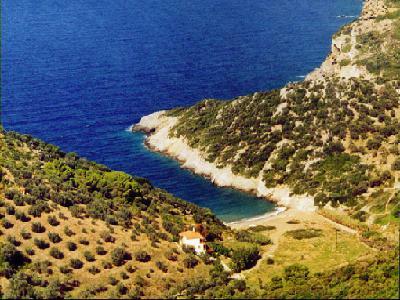 Further north of Vythisma Beach, at about five kilometre distance fom the capital of the island of Alonissos, lies the little sandy bay of Vrysitsa (little fountain), tucked into a narrow inlet. A little tavern stands near the beach and there are a few villas in the area. This beach which is situated in the northwest of the island of Alonissos can be reached via the road that leads from Chora and it can be seen from the road as you drive by. Vrisitsa Beach consists of dark sand and pebbles. In the surrounding are a couple of other nice beaches, such as Vythisma, Mourtia and Marpounta Beach. Vrisitsa Beach gets its name from the fact that it is quite small and because the cove where the beach is located is surrounded by a green hill. The hill makes sure that the beach is quite protected and there is usually not much burden on the wind. Normally it is not very crowded on this beach.